Julius Thurgood's HRDC promises an amazing variety of unlikely racing cars including a Rover 90, an Austin A90, a Lancia Aurelia, a Standard Pennant and a Studebaker Golden Hawk at the Donington Historic Festival on Saturday 3rd May. The 45 minute race, with a compulsory pit stop, is actually over-subscribed. Celebrating the early years of the British Touring Car Championship (formally known as the British Saloon Car Championship) from 1958 to 1966, the HRDC has assembled a fascinating array of historic touring cars. Early-period cars range from the rarities of David Wylie's Armstrong Siddeley Sapphire and Malcom Verey's Jensen 541R (as raced as a saloon by John Webb in period), to the more familiar Jack Sears-type Austin A95 Westminster of Nick Naismith and the Jeff Uren-style Ford Zephyr Mk2 of Alistair Dyson. 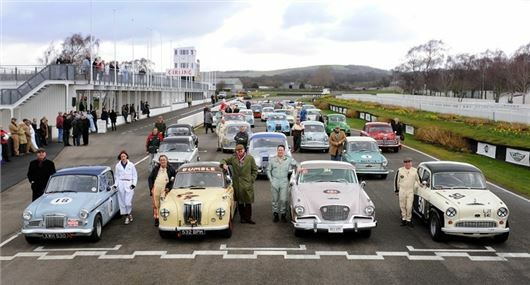 Mid-period cars include the rare works-style MG1100 of Steve Atkinson, the original, ex-Lawrencetune Vauxhall VX4/90 of Paul Clayson and the stunning Graham Hill-homage Jaguar Mk2 of Simon Drabble, while the later-era cars are typified by the Alan Mann-liveried Lotus Ford Cortina Mk1 of Howard Wise and the Sir Gawaine Baillie-inspired Ford Falcon of reserve entry Mike Gardiner. HRDC Founder and Race Director, Julius Thurgood, was upbeat about the forthcoming race: "Now that most historic touring car races are usually polarised by specific models of cars that are considered to be the fastest cars of their type, it is rare to see a greater variety of marques and models competing together. Taking the initiative of running a grid combining both '50s and '60s cars has paid off handsomely, with the fact that we will be fielding no fewer than 28 different models from 18 different marques on a 36-car grid, which I am sure will satisfy the most discerning touring car aficionados at the Donington Historic Festival. The competition up and down this capacity grid will certainly bring some thrilling battles to this unique feature race". The 2014 shakedown day is one of the videos on the HRDC site.